Beautiful barn, immaculately clean, lovely location, amazing view from hot tub,home made cake, fresh eggs and milk on arrival they have thought of everything, we love it! Can't fault the standard of this place. Perfect in everyway. Easy to find. Hot tub wonderful. Fresh eggs too. A simply stunning location and cottage. Arrived to fresh scones and eggs! A very cosy cottage where we felt very relaxed, especially with the use of the hot tub and roll top bath! We will be back! We had a lovely short break in Orchard Barn. The barn is very cosy, comfortable and well appointed. The setting is amazing - very secluded, with lovely views down to the river. It’s an idyllic setting and the owners made us feel very welcome. We’d definitely stay again. We stayed for a week at Orchard barn. We were welcomed by Ute, a bottle of wine, flowers, fresh eggs and homemade brownies - certainly the warmest welcome we've ever received! The barn was just what we needed with a private patio and hot tub out the back with views over the field and distant trees. We loved exploring west Dartmoor and then returning to the comfort of the barn or a soak in the hot tub after a long walk. We definitely hope to return for another peaceful break away from everything. Thank you Richard and Ute! Excellent place to get away from it all. Highly recommended. We stayed four nights at Orchard Barn but wish we could have stayed much more. What a place! Such a beautiful location and so peaceful, without being remote. 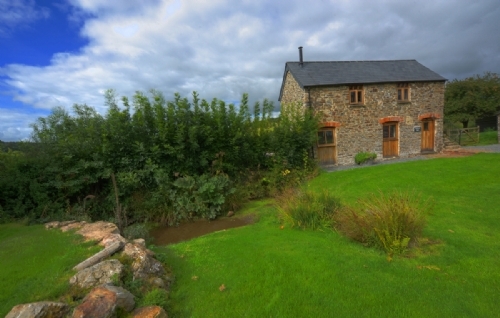 The barn has been very tastefully converted, is well equipped with plenty of space for two, as well as our black lab. Even though the other four barns on the property were full, we felt quite secluded sitting on the patio looking over the valley and walking the fields to the river below. Ute and Richard are excellent hosts and helped contribute to a very relaxed break. With so much to do in the local area, this is definitely a place worth visiting again and again. Unfortunately we didn't get around to using the sparklingly clean hot tub but have made a note to do so next time. We both really enjoyed our long weekend at Devon Country Barns. Total peace and quiet with stunning countryside views. The barn was beautifully presented and had everything we needed. Our dogs couldn't believe their luck with the acres of fields they could run in and the river to cool off in. 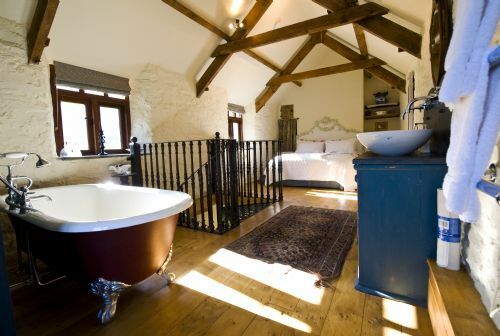 We would definitely recommend Devon Country Barns! Fantastic place, we received a warm welcome with home made cake, eggs, fresh flowers and a bottle of wine. Our host Richard whent above and beyond to make us feel at home, he even looked after our two dogs on 3 occasions while we went to a few of thier restaurants that Richard recommended. Thoroughly enjoyed the hot tub, whilst overlooking the beautiful scenery. Brilliant place to relax, unwind and reachard your batteries. Couldn’t fault Orcchard Barn, beautiful location, stunning views, spotlessly clean and very friendly hosts, not to mention the hot tub! Booked the Orchard barn for a surprise weekend away for my Anniversary. My wife loved it from the moment she seen where we were staying and we both really loved the remoteness of the location. The hot tub temp was set a bit too high for us (38c) but once in we enjoyed relaxing in it looking over the surrounding fields. Lovely property, owners are very helpfull with recommendations for pub’s, cafés, shops, walkingplaces for dog’s, etc..
My wife and I spent three days in Orchard Barn, everything we could possibly need was provided, and Ute showed us round so that we were familiar with everything. The bed was comfy, good quality linen and towels, and the extra towels for use with the hot tub was a very thoughtful touch. We made use of the hot tub twice a day, and it was a real treat! Only one slightly negative comment, the duvet was king-size (I would think) and the cover possibly was super-king, so that there was a flap of unoccupied duvet cover on each side of the bed, just a small thing, and it didn't impact on our stay atall. The whole experience was peaceful, secluded and thoroughly enjoyable. We love the quirky furnishings and objets trouve used as decorative items, loved the double washbasins, and the bath! We would come again! My only regret was that we forgot to put an entry in the visitors' book! I recently stayed at the country barns with my partner for 5 days. We had been before so knew how lovely it truly is. We decided to revisit and was not disappointed. We were greeted with local wine and a home made cake to welcome us. The accommodation came equipped with every utensil you would need from a blender to BBQ equipment. The hot tub was delightful with incredible views of the stunning countryside. We do not have dogs but I would imagine they would love the area with lots of private land to explore with a beautiful river. The owners could not have been nicer despite having missed them when entering, we caught them on the way out wishing us a safe journey. We will definitely be going back soon for another relaxing break. A thoroughly enjoyable stay. Beautiful barn conversion combines luxury and quality with with lots of charming features. Owners were friendly and helpful, the fresh eggs and cake on arrival were a lovely touch. Watching the sun set from the hot tub was a highlight. Lydford Gorge and Cotehele stunning places to visit. Will definitely recommend and hope to return! A really beautiful barn with great facilities! Really enjoyed our stay at the barn - wanted to stay for a week rather than a weekend! The hosts were away but did everything to make sure our visit was comfortable and easy. All the little touches were lovely. Only improvement is that a few of the kitchen utensils are broken / blunt (including the knife sharpener!) - not a big issue at all but one that can be easily fixed. Wow what a place. We loved every minute of our stay on Orchard Barn. We will most definitely return hopefully this year and can’t recommend it enough. An amazing barn overlooking the most spectacular scenery. Everything is beautifully maintained and private. The owners go the extra mile to ensure you have the most perfect stay by providing fresh eggs, a home made cake, wine and flowers on arrival. The hot tub and facilities are amazing. We love it there and already can’t wait to go back! We had an amazing weekend at Orchard Barn. The quality and attention to detail of the cottage was first class, and the outlook from the hot tub over the fields was the icing on the cake. Our hosts had provided every thing we could need and there isn’t a thing we would change about the stay (except for wanting to stay longer!). For a relaxing getaway for two, we can’t recommend this cottage enough. We had a very relaxing weekend my husband and I and our dog loved every minute. We loved the underfloor heating, the log burner, the hot tub where we spent all Saturday afternoon in the wind and rain. We loved the surrounding fields and river and the bed was so comfortable. The hosts were great with their recommendations for dinner and breakfast. We enjoyed every second, the barn was perfect. Thank you. On our second time in Orchard Barn and our forth time at the Devon Country Barns there can only be one resume: Great location, wonderful hosts and beautiful country-/seaside! You will be loving it all. We first stayed here for our 6 month anniversary, since 2014 we have been going back and last year was we went for a week just before Xmas. We are always always welcomed and made to feel at home. I would always always recommend this place to friends and family that appreciate a slice of idealic country side. Richard and Ute are very hospitable.